To me Mexico City is kind of like a guy you know is bad news, but for some reason you still find yourself thinking about him. The feelings are mixed; and here are my likes and dislikes about Mexico City. I’m obsessed with high places with amazing views. Mexico City spoiled me rotten with that: rooftop bars and restaurants, crazy sunset skies and endless spreads of streets and buildings. 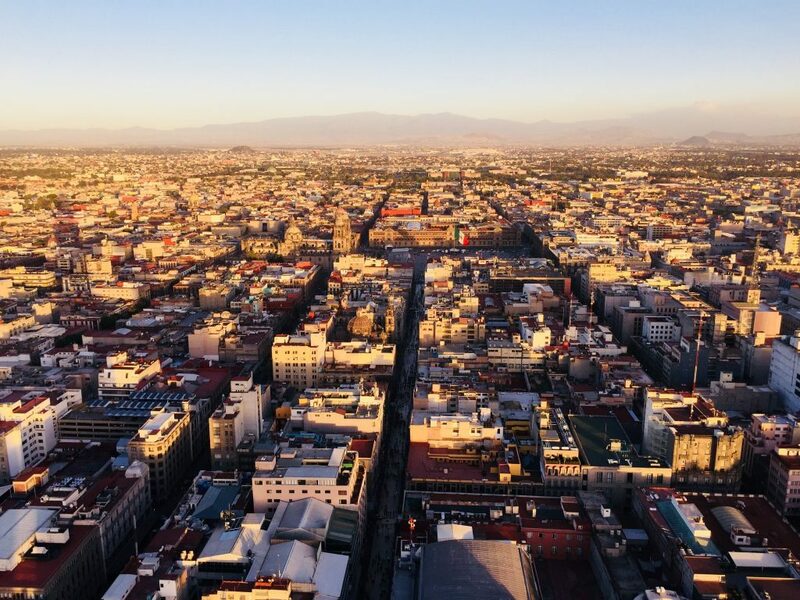 My two favourite were the rooftop of my hostel right in the city centre, a few steps away from Templo Mayor, and one of most awesome views I’ve ever seen from Torre Latinoamericana. View of Centro historico from Torre Lationamericana. After a month spent in Mexico, I have tacos, quesadillas, burritos, enchiladas, you name it looking out of my ears already. If I had problems finding anything else but Mexican food before, Mexico City made up for it big time! Asian, Italian, French restaurants, I missed you so! I had edamame and sushi three times in four days, they cost peanuts here. Like every big city, there is so much happening here it’s difficult to follow. I was lucky to visit the city during Semana de las Juventudes 2017, which meant concerts at the Zócalo square all day long, every day. But even if you just walk through a random park, there are free dance lessons, sport events, theatre plays, chess competitions and even music instruments classes basically on every step. I’ve been to Tehran this year, where people were flocking to the mountains around the city for some fresh air. I lived in Brussels, which on bad days has higher concentration of polluted particles in air than Beijing (does it really though? Or do they just measure it at an exhaust pipe of a car passing Le Grand Central at Place Jean Rey? ), and I’ve never complained about polluted air in my life. Here I do. It’s giving me headaches on daily bases. It’s really bad. But then what do you expect from a place with 22 million people? I usually don’t overreact when it comes to these things. I took a taxi boat to an island in Panama by myself in the middle of the night, I backpacked Iran with another blondie, I can’t count how many times I walked Brussels’ Anspach and Cinquantenaire park at night. But if locals tell me that I really shouldn’t go down this or that street, that’s good enough for me. It happened for the first time here that I put my phone in my bra (like a Dutch girl I used to live with in Denmark did every time we went out), because I freaked out I will get robbed in a shady street of Centro historico. It is huge. There are traffic jams and people jams everywhere, all the time. It takes you forever to get anywhere. You have to be pushed in the metro sometimes, so that the door can close behind you.